In our world of medical innovation and an increasing average lifespan, medical and ethical questions are at the forefront of many Christians' minds. Pastors can find themselves in positions to give advice about these matters on many occasions, a situation in which they may not feel qualified. Caring for Those in Crisis is designed to give pastors a solid footing when asked for advice in critical medical decisions. It starts readers off on a path to formulate and define their own values based on biblical and historical instances of advocacy and ethics. 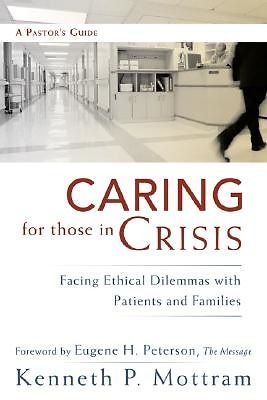 It also offers a decision-making model for ethical dilemmas, discusses Christian distinctives that pertain to medical and death and dying decisions, and discusses frequently encountered ethical problems, like organ donation and life support. This extremely practical and detailed resource is one no pastor should be without.